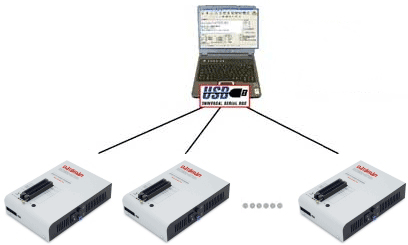 Super fast universal 48-pin chip programmer with ISP capabilities and USB 2.0 connectivity. Independent programming options combine with device insertion tests and a user friendly interface to give higher programming yields and reduced failure rates. The 48Pro2 Gang is built to meet the demands of development labs and programming houses requiring a scalable system. By operating multiple 48Pro2 programmers from the same PC, you can create a high volume production environment with all the benefits of the standard 48Pro2 such as universal 48-pin ZIF socket, ISP capabilities and USB 2.0 connectivity. Up to four 48Pro2 programmers can be connected simultaneously providing a highly scalable gang programming system. Independent programming is more efficient than the concurrent programming method used in traditional gang programmers as each site operates independently allowing programming to start as soon as each device is inserted into the ZIF socket. Before the last device is loaded, the first device is already programmed and ready for removal. The operator is always busy removing and inserting chips, so both the operator and programmer are running continuously at maximum efficiency. With traditional gang programmer operation, the operator is idle while chips are being programmed and the programmer is idle while chips are being removed and new chips inserted. Therefore for the medium programming times, you can easily achieve the throughput of an eight socket gang programmer with two - four 48Pro2 programmers. 48Pro2 programmer offers the same advanced features as 48Pro+ programmer but with much higher programming speeds (20-75%) for high-capacity memories. Built-in protection circuits eliminate damage to the programmer and/or programmed devices due to environment or operator failure. All the inputs of the 48Pro2 programmer, including ZIF socket, connection to PC and power supply input are protected against ESD up to 15kV. 48Pro2 programmer performs programming verification at the marginal level of supply voltage, improving programming yield and guarantying long data retention. Project files are used to control the 48Pro2 multiprogrammer. The project files contain user data, chip programming setup, chip configuration, auto programming command sequence, etc. This helps minimize operator error as the project file is normally created and proofed by engineer and passed to the operator. The optional protected mode can be set avoiding unwanted changes to the project file. Standard device-related commands (read, blank check, program, verify, erase) are enhanced by test functions (insertion test, signature-byte check) and additional special functions (autoincrement, production mode - programming starts immediately once chip inserted into socket). Three Year Guarantee - Three years parts and labour warranty, on the 48Pro2 universal device programmer. Life-Time Technical Support - 48Pro2 technical support is available free via our website and telephone helpdesk for life. Life-Time Software Updates - 48Pro2 software updates are available free via our website for life.